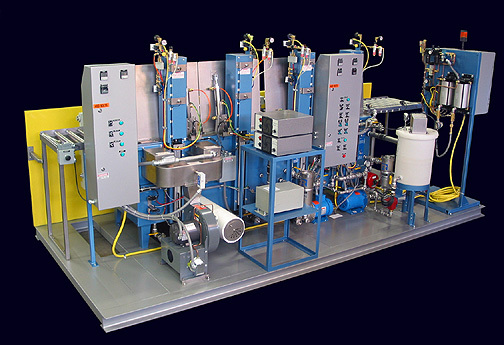 This application is a Precision Wash Rinse Rinse Dry System for critical cleaning of hydraulic valve bodies. It thoroughly processes a complete family of valve blocks that have been precision machined with many threaded holes, some though and some blind. 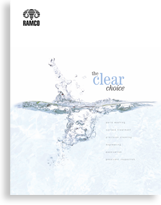 The system achieves very high cleanliness specifications in accordance with the manufacturers requirements. The line is constructed from two stainless steel modular MKD24 Console Systems and runs left to right. The consoles are built upon a heavy duty I beam fabricated base for accuracy, stability and ease of shipping and installation. The photo above shows the rear of the system. 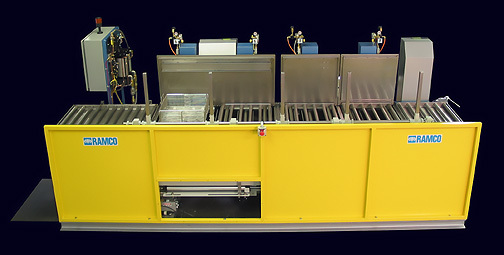 The control pedestal (to the far right) includes a main Nema12 panel with the air over oil tanks and flow controls mounted behind the control box. Note that nothing is placed underneath processing tanks or tucked behind “access” panels. All valves, pumps, filters, cylinders and heaters are located outside of the console where they are accessible, clearly visible for inspection and easily serviced. RAMCO automated systems are designed for industrial applications. Valve blocks are loaded into baskets and placed onto a loading station. The system recognizes the baskets using proximity sensors on an infeed conveyor. The operator presses a start button to begin the cycle. The walking beam assembly retracts into transfer orientation and moves the basket onto the elevator of the first processing stage. The walking beam assembly has multiple arms corresponding to the number of stages within the overall system. The walking beam moves left and right on linear bearings over hardened steel shafts and articulates ninety degrees at the beginning and end of each cycle.